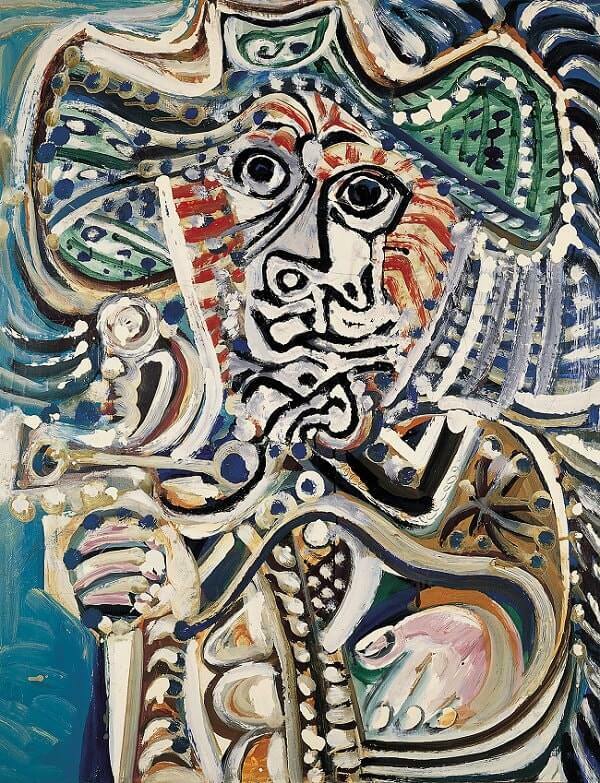 As Franz Meyer wrote in 1976, "the musketeers Picasso painted after the end of 1966 [form] an extremely heterogeneous group, some of them unkempt fellows, others noblemen." Musketeer with Sword, is an obvious example of the "unkempt fellow" type. This becomes especially apparent when being comapred with The Musketeer of 1967. While in the previous painting, the baroquesque costume puts one in mind of a seventeenth-century nobleman, whereas in this painting, the clothing is altogether suppressed. The beard is far less neat and curly, and the hair, except for one thick strand, is hidden under the huge, broad-brimmed hat. This musketeer, his lean body sharpened down, maybe, by incalculable duels, looks a bigger number of contentious than his rotund forerunner, who sits there agreeably established. The sword in his right hand is typical of intensity in every sense, and he holds it up as though in exhibit of this..